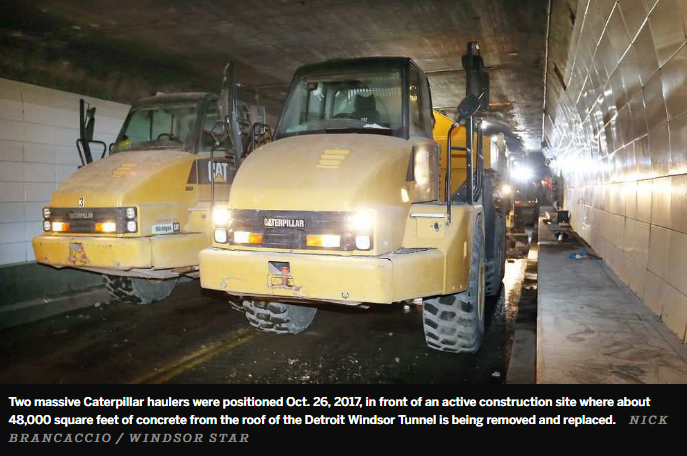 A grievance has been filed against the Michigan company performing the US$21-million ceiling replacement in the tunnel for failing to hire any Canadian workers for the job. Toebe Construction, based in Wixom, Mich., was awarded the contract for the complicated project to replace the original concrete ceiling inside the tunnel. The tunnel was closed starting Oct. 20 and is to remain closed until Monday morning at 5:30 a.m. to allow for demolition of the old ceiling. The tunnel will then be closed evenings, from 8:30 p.m. to 5:30 a.m., till June as work is completed. But the labourers and heavy construction operators are strictly workers from the U.S. — even those doing the job on the Canadian side of the border, according to LiUNA Local 625, which filed the grievance with the company on Monday. The company has seven days — until this coming Monday — to adequately respond or the grievance will go to the Ontario Labour Relations Board, said Rob Petroni, the union’s business manager. “We have nobody on the job site — no Canadian workers,” he said. He made a half-dozen calls to the company before the project started asking “what do you need?” in terms of workers, Petroni said. “There were no emails or calls returned (from Toebe),” he said. More attempts to speak with company executives earlier this week also received no response. Tunnel CEO Neal Belitsky was also contacted, but also has not responded to the union, Petroni said. “Unless they set something up I don’t know about, it’s illegal for U.S. citizens to be working on Canadian soil,” he said. Messages left with Toebe company executives Thomas Stover and Bob Jones on Friday were not returned. There are 16 workers handling the tunnel’s ceiling demolition this week — which include demolition technicians, concrete form workers and general labourers. Half of the 16 on the job should be Canadian union workers, Petroni said. Each employee is working 10-hour days, seven days a week. Salary and benefits for each equates to roughly $45 per hour, Petroni said. The union’s grievance is seeking damages that include all lost wages, benefits, pension and vacation pay dating back to Oct. 20, with interest, according to a copy obtained by The Star. The union is also seeking damages in the amount of $48,916.80, which will increase each day the alleged violations continue. Toebe has a history of doing construction work in Windsor — which includes the Herb Gray Parkway and on the Ambassador Bridge — and always retained Canadian employees previously. 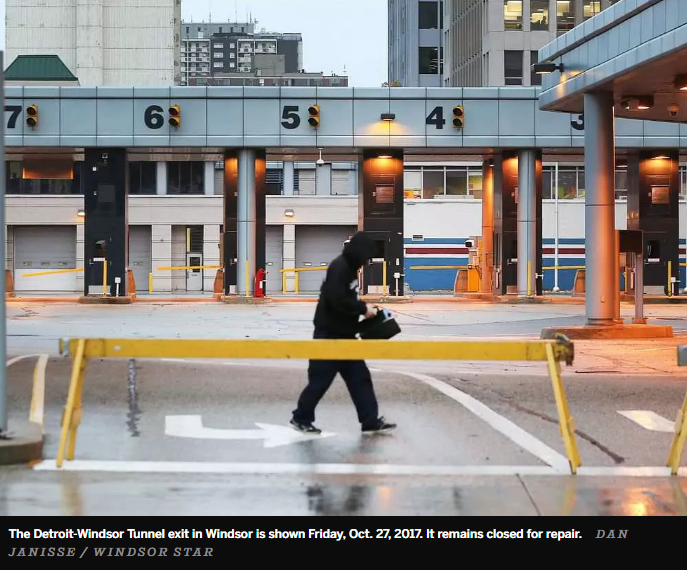 Jim Lyons, executive director of the Windsor Construction Association and local Heavy Construction Association, said Friday he was “surprised” by the company’s failure to hire Canadian workers for this side of the border inside the tunnel. The grievance should “remind” the company of their obligations on the tunnel’s Canadian side, Lyons said. Windsor Mayor Drew Dilkens, board chairman for Windsor’s tunnel corporation which oversees the Canadian side, was aware of the grievance. He noted the Canadian side of the tunnel has a joint operating agreement with Belitsky and his Detroit corporate entity for them to handle operations, so was not involved in awarding the contract or deciding who is doing the job on the ceiling project. The mayor guessed there were significant cost savings for the contractor by not having to hire two sets of employees for the tunnel’s ceiling project. “I am hopeful the contractor and the union will work out the differences they have,” Dilkens said.